The current-day version of the venerable Adams bears little resemblance to Halladay’s original fly, but the pattern still performs as an all-things-to-all-trout imitation. THE NOVELIST AND SPORTING writer Thomas McGuane summed up the near-mystical popularity of the Adams dry fly when he wrote that it’s “gray and funky and a great salesman.” After more than eighty years of hard use and a series of fresh permutations, the salesmanship of this enormously popular and long-enduring American original has only improved. In fact, the great lesson that the Adams offers to any tier who wishes to create an immortal fly pattern is its generalism; not only has it proven to be all things to all anglers, but it seems to be all things to almost all trout, as well. Though the fly is intimately associated with Michigan’s famous Boardman River, its genesis involved another water, Mayfield Pond, which Michigan angler Jerry Dennis tells me is “an impoundment of Swainston Creek, a tributary of the Boardman, and about a mile up from the river.” One summer day in 1922, Charles F. Adams — a Lorain, Ohio, attorney — was fishing the pond when he saw an insect that interested him, so when he returned to his hotel, he described it to local fly tier Leonard Halladay. The first Adams I made was handed to Mr. Adams, who was fishing a small pond in front of my house, to try on the Boardman that evening. When he came back next morning, he wanted to know what I called it. He said it was a “knock-out” and I said we would call it the Adams, since he had made the first good catch on it. Why Adams didn’t try the fly on Mayfield Pond, where he had just seen the insect itself, remains unclear, but the Boardman became the river of record for the fly’s first triumph. Several accounts agree that the fly originally had a tail of two golden pheasant tippets. Perhaps for convenience’s sake, or maybe just because the tippets weren’t all that supportive, that tail faded from the fly-pattern books pretty early and was replaced by grizzly or brown hackle fibers. The vivid Edgar Burke fly paintings in Ray Bergman’s Trout showed that the pheasant tippets had been abandoned by some as early as 1938. Master fly tier Bill Blades was still recommending the golden pheasant tippet tail as late as the 1962 edition of his great work Fishing Flies and Fly Tying, though he also suggested the now-standard grizzly hackle fiber tail. If anyone still sells the fly with the golden pheasant tippet tail, I’d love to hear about it. Setting aside this one change in the fly’s construction, we come to the central question that the Adams raises in fly-pattern history: How much can we change a pattern and still call it by the name its originator gave it? By any stylistic standard, the original Adams is about as much like its modern descendant as my 1960s dormitory stereo is like the latest iPod. Think of the fly I have just described, and then turn to the pages of any of today’s beautiful fly catalogs and look at the modern commercial Adams. You will find it in the same row with the other “classic” American dry flies, and it’s a sure thing that it will look as fine and trim as all the others. What’s happened to Halladay’s creation? Well, several things happened. And out of respect for our sport’s lovely traditions, let’s start with the affirmative view, which runs like this. As trout have been exposed to more intensive fishing pressure by more anglers using better gear, it was necessary to adapt the scruffy old Adams to the demanding tastes of these more discriminating fish. The fly had to trim down and tidy up, especially when it was tied in smaller sizes to imitate tiny insects. I don’t doubt that this is true. But we should also consider the cynical view. Commerce deplores unnecessary production complications, and we anglers love our cookbook-precise formulas. For upwards of a century now, the prevailing “gold standard” of American dry-fly style has been the lovely, sparse lines of the Catskill dry fly. Say “dry fly” to most commercial fly tiers of the 1940s, 1950s, and 1960s, and they would mostly likely mentally picture a beautiful, sparsely hackled Quill Gordon or Red Quill. They might then think of the Wulffs and other flies of a more unruly ilk, but at heart everybody knew what a “proper” dry fly was supposed to look like. So it should be no surprise that in the 1920s and 1930s, when this very popular new dry fly, the Adams, drifted in from the Midwestern hinterlands, it would immediately be stuffed into the traditional Catskill pigeonhole and become a sleek, beautiful, and inauthentic shadow of its original self. It is a testament to the greatness of the original pattern that even its anorexic form is still amazingly effective. Interestingly, this devolution in the Adams’ physiology took much longer in the fly’s corresponding westward migration. In the early 1970s, at the dawn of the Selective Trout era, well-stocked western fly shops still might feature nail-kegs full of Humpies and other unruly “cowboy flies” as the staples for everyday angling. Western tiers, though beginning to respond to the stylistic and commercial imperatives of the hard-core hatch-matchers, still had deep loyalties to hearty, rough-water patterns. They recognized the big Adams as one of their own, and didn’t feel the need put it on a diet. One day in about 1973, in Pat Barnes’s grand little fly shop in West Yellowstone, I was watching his spouse, Sig, tie flies. Pat had adapted an old treadle sewing machine to create a home-made rotary fly-tying vise. It was an entrancing revelation for me to watch Sig simultaneously feed three big hackles — two browns and a grizzly, as I recall — onto the rotating hook of a genuine Halladay-style Adams. 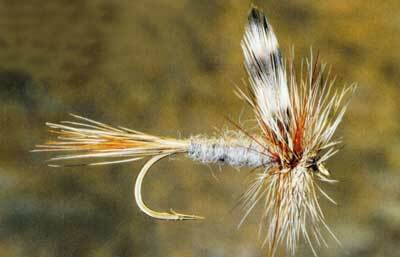 Not only did this approach contradict the advice in all the fly-tying manuals I’d read — wherein it was sacrilege to wrap more than one hackle at a time — it also resulted in a tough, broad-shouldered dry fly — a longshoreman among the ballerinas. But in a surprisingly short time after that, the big old Adams was mostly gone, homogenized away by the global standardization of fly patterns. The great thing about the Adams, though, is that it can still pretty much be whatever we want it to be. Charles Adams himself thought it imitated an ant. Biologist-angler Sid Gordon, writing in 1955, spoke for generations of anglers before and since when he said that if you slanted the wings back a little you could “go any place in the country and have a common-place, staple imitation of the caddis in just this one pattern.” The Adam fills in for everything. At need, I’ve used it as a midge, a PMD, a Hendrickson, and a dozen other things I didn’t know what to call. We all recognize an Adams hatch when we see one. And of course we didn’t stop modifying it just by restyling its proportions. We’ve customized it in countless ways, with parachutes, egg sacs, different wings, different bodies, and different tails. Many of these new versions of the fly, had they been originated by someone who never saw an Adams, could legitimately have been given different names. But I suppose it’s part of the legacy of the Adams that we keep naming these things after it, in the hope that they will still have that magical Adams salesmanship.